With a triple action Hygeia Lawn Feed, Weed and Mosskiller feeds the grass, kills weeds and moss all in one step. This product is the best value on the market as it has the most coverage per weight. Treating 50sq m per kilo, this feed and weed formula not only works out cheaper per sq. m than other brands, it also saves you time re-filling, saves cost on reorder charges & leaves you with less waste packaging to dispose of. It will kill a range of weeds, remove moss & fertilise the grass for a stronger and healthier looking lawn. You can expect to control weeds such as daisy, plantain, dandelion & clover. Contains ferrous sulphate to kill moss quickly, and Dicamba for weeds, while fertilising the grass at the same time with a balanced feed to stimuate roots and leaves. Supplied in a 3Kg pack, enough to treat 150sq. m,around. 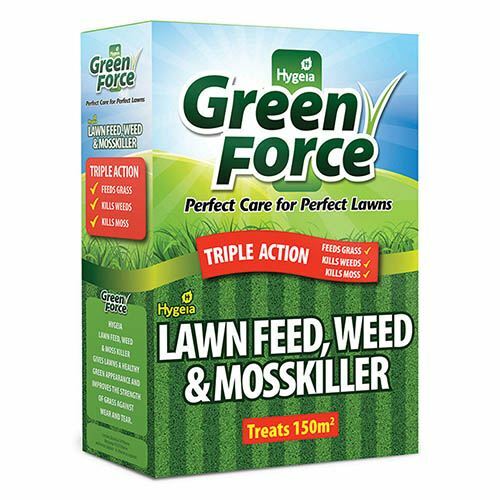 Apply GREENFORCE LAWN FEED WEED & MOSS KILLER, during the growing season from early Spring (April). Re-treatment may be necessary for heavy moss infestation or if moss returns. Ideally do not apply for 4 days before mowing and 3 days after. Apply product on a still day, when lawns are growing actively, and the soil is moist. Do not use during drought or freezing conditions. Apply 20g per m2 evenly over the surface. For accuracy and evenness of coverage, mark out the area to be treated using string or canes. Your lawn should thicken and become a rich green colour. Total weed control may take around 4 -5 weeks. Some weeds may grow vigorously at first and become distorted and twisted. The moss in the lawn will blacken as it dies (any blackening of the grass is only temporary). After 7-14 days rake out the dead moss. Avoid walking on treated areas until it rains, or the product has been watered in. If no rain falls within 2 days, water the lawn thoroughly, so as to allow the product to work. Once the product is fully watered in, children and pets need not be excluded. Disposal of Lawn Clippings: For mulching do not use the first three mowings after treatment. After six months of thorough composting, they will be safe to use. Avoid drift onto vegetables, flowers and all neighbouring vegetation. In addition, staining and discolouration can occur if the product comes in contact with paving, concrete slabs and clothing etc. If this occurs, clean off immediately.